A flow of funds within the Foundation is shown in the graphic below. As shown, Rotarians, Rotary clubs and districts, their friends and others contribute to the Foundation. Individual and club donations are the lifeline of The Rotary Foundation (TRF). Gifts to PolioPlus support Rotary’s polio eradication efforts around the world. Gifts to the Annual Fund – SHARE are the primary source of funding for a broad range of local and international Rotary Foundation activities. Funds are invested for three years and then released for grants. The earnings during the three-year period are used for administrative purposes. Through the SHARE system (see below), contributions to the Annual Fund are transformed into grants for projects that change lives. Gifts to the Endowment Fund are professionally invested; the principle of the gift is never spent and is held in perpetuity. The Endowment Fund ensures the long-term viability of the Foundation’s grants and programs. This article will focus on the Annual Fund being the lifeline for grants. 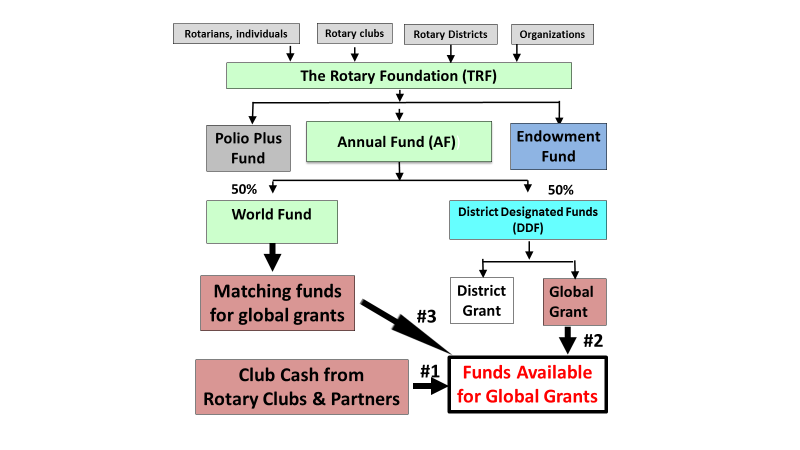 As shown in the graphic, these funds are divided equally into two components, District Designated Fund (DDF) and World Fund at the end of each Rotary year (after the three-year holding period). DDF funds are part of the Annual Fund and TRF controls and manages these funds. TRF has empowered districts to allocate these funds according to their own policies that vary between districts. District Grants are funded mainly by a percentage of District Designated Funds (DDF). A district may use up to 50% (will increase to 60% in 2019-20) of the new DDF to fund District Grants. New DDF is half of the contributions to the Annual Fund – SHARE three years prior to the program year. The other half of the contributions goes to the World Fund. Global Grants are funded with DDF and World Fund match. assist in the development of stronger Rotary networks as clubs and districts from different communities or countries/geographical areas work together. support activities sponsored by two Rotary clubs or districts; one located in the country where the activity will take place (host) and one outside of that country (international). Global Grants are initiated and executed by Rotarians within TRF guidelines. They decide what, where and how to execute projects without top-down directives. They provide time, talent, money and expertise for successfully completing projects with sustainable results, measurable outcome and impact. #1 - Club Cash from individual clubs, both inter- and intra-district partners. #2 - District Designated Fund allocated by each partnering district based on its policy. #3 - The World Fund matching dollars based on a formula. Rotarians manage the funds and are responsible for its stewardship and reporting. Every Rotary club has access to TRF funds based on the merits of the project. Power of Partnerships: Global Grants require partnership to raise funds. It is critical to bring together multiple clubs to partner and raise cash to meet the grant budget. Club cash receives TRF matching from the World Fund. Many clubs do budget a few thousand dollars for participation in international projects. Partnering offers each club the first entry point and an opportunity to be engaged in international projects. Club-to-club intra-district partnership: A club sponsoring a Global Grant within a particular district should be able to attract other clubs within the same district to contribute club cash. Club-to-club inter-district partnership: Beyond intra-district partnership, attempts should be made to bring clubs from other districts to be partners. Both inter- and intra-district partnering clubs should also seek DDF from their respective districts to support the project.As shown later, DDF is key to a higher-level project budget and TRF financing without increased club cash.The more the DDF, the better. Power of Matching: The Rotary Foundation (TRF) has devised a unique SHARE system that provides matching dollars from the World Fund. These matches have a multiplier effect, providing a substantial boost to the cash committed by clubs and DDF allocated by districts for the project. Club Cash match: The World Fund will match the combined club cash by 0.50:1. DDF match: The World Fund matches 1:1 to DDF allocated by districts. Non-Rotarian Contributions match: The World Fund matches 0.5:1 non-Rotarian cash contribution as long as they are not benefiting from the project. This table shows an example of various DDF allocations while keeping the club cash amount (A) the same at $10,000 for each case. Club Cash (A) is the combined amount of cash raised among inter- and intra-district clubs. It is kept at $10,000 in this example. DDF (B) is the combined amount of DDF allocated independently by the districts. Examples of DDF:Cash match ratios varying from 0.0 to 2.0 are included. Club Cash match (C) is the World Fund match based on 0.50:1 of the club cash (A) of $10,000. DDF match (D) is the World Fund match based on 1:1 ratio of the DDF (B). E = A+B+C+D provides the total budget amount for each of the scenarios. Multiplier is the number by which the club cash is multiplied to arrive at the total budget (E). %Boost in budget is the multiple in percentage form. F = C + D is the total of World Fund match. G = B + C + D is the total of funds provided by TRF for the project. DDF (B) funds are added here to arrive at the total TRF financing. DDF is part of the Annual fund and TRF controls and manages these funds. H = % of TRF financing with respect to the total budget increases as a function of DDF:Cash ratio. The above data is presented below in bar chart form. Left chart shows parameters E, in blue, and G, in orange. Right chart shows parameter H. Note that TRF is contributing 82% for 2:1 DDF match compared to 33% for 0:1 DDF match. In another example, the total budget is kept constant at $70,000 and the required club cash is calculated by dividing $70,000 by the multiplier. Results are shown in the table and bar chart below. 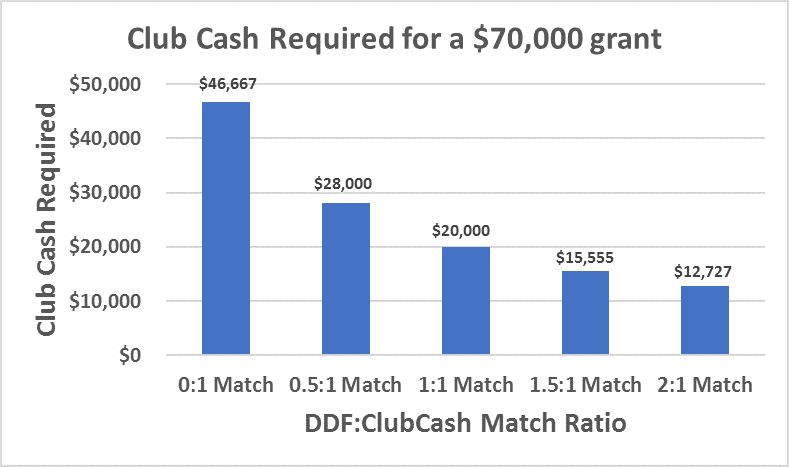 Note that the club cash required in the 2:1 match scenario is $12,727 as opposed to $20,000 for the 1:1 match scenario - a drop of about 37% - for the same grant budget of $70,000. The contrast is much more significant when compared to the cash required ($46,667) for the 0:1 match ratio. The reduction in required club cash is compensated by the increase in TRF contribution to maintain the $70,000 project budget. TRF has recently introduced a processing fee to handle club cash contributions. A 5% fee needs to be added if the club cash is sent to TRF for processing soon after the grant is approved. However, this fee can be waived if the cash contributions are sent directly to the host club’s bank account for the grant. This article provides a step by step description of the Global Grant financing that hopefully makes it easier to understand. Those who claim it is difficult should spend some effort to learn and they will be surprised to discover how easy it is. TRF provides matching funds that enhances the budget as well as its percentage contribution towards a project. DDF is key to getting more funding from TRF. Rotarians should focus on establishing club-to-club partnerships for cash and increased inter- and intra-district DDF for the project. Districts receive DDF based on their contribution to The Rotary Foundation. Do donate to The Rotary Foundation to generate more DDF to allocate to projects.